The Dried Prune is one of the most popular of dried fruits also most common dried fruit. They are considered to be one of the healthiest foods and are mostly known for their laxative properties. Prunes are rich in fiber content and are highly nutritious with high levels of essential nutrients like vitamins and minerals. 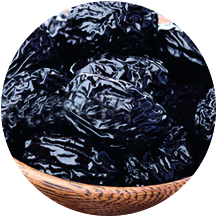 Prunes are high in antioxidants called phenols. This helps protect the cells membrane from free radical damage and also aids in the prevention of cardiovascular disease. Prunes are rich source of phenolic and flavonoid compounds. These compounds are very effective to not only slow bone loss, but also reverse some types of bone mineral density loss. Prunes are used in cooking both sweet and savory dishes, juices and in the bakery industry.